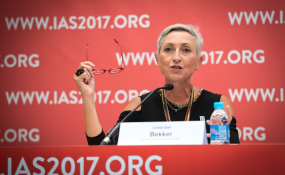 Each of the studies highlighted in a conference this week "takes us one step closer to the end of HIV," says Linda-Gail Bekker, president of the International AIDS Society and director of South Africa's Desmond Tutu HIV Centre. Dakar — "Stigma and a lack of information and knowledge about HIV and AIDS across Africa means a huge number of people are getting left behind"
The tide may have turned in the global fight against AIDS, but too many people in sub-Saharan Africa are developing and dying of AIDS-related diseases due to limited testing and problems with treatment, Medecins Sans Frontieres (MSF) said on Tuesday. More than half of people infected with HIV worldwide are now getting drugs, and AIDS-related deaths have almost halved since 2005, putting the world on track to hit the target of 30 million people on treatment by 2020, the United Nations said last week. Despite much improved access to antiretroviral (ARV) drugs in sub-Saharan Africa, an "unacceptably" high number of people are developing AIDS and dying due to drug resistance, treatment being interrupted and late diagnoses, the medical charity said. Sub-Saharan Africa accounted for almost three-quarters of the one million AIDS-related deaths recorded last year, according to data released this month by the UNAIDS agency. "Stigma and a lack of information and knowledge about HIV and AIDS across Africa means a huge number of people are getting left behind," Sofie Spiers, a doctor and HIV specialist with MSF, told the Thomson Reuters Foundation by phone from Paris. "We need to ensure increased access to ARV drugs are backed up by awareness raising at a community level, and better care for those who have been on treatment for years," Spiers said from this week's International AIDS Society (IAS) conference. Many AIDS patients across sub-Saharan Africa show signs of treatment failure when they arrive at health facilities - often too late - and need to be switched from first-line to second-line ARV drugs more rapidly to combat resistance, MSF said. Rising resistance to HIV drugs could undermine the progress made against AIDS unless countries urgently review their HIV treatment programs and switch to different drug regimens, the World Health Organization (WHO) said last week. The situation for those living with HIV and AIDS in sub-Saharan Africa could deteriorate even further as donor funding declines, according to several public health organisations. Donor government funding to support HIV efforts in low- and middle-income countries decreased to $7 billion last year from $7.5 billion in 2015, the lowest level since 2010, said a report published last week by the Kaiser Family Foundation and UNAIDS. "With global political will and funding for HIV on the decline ... these patients arriving at hospitals sick with AIDS will have any hope of reprieve snatched away," said Mit Philips, health policy advisor at MSF. Copyright © 2017 Thomson Reuters Foundation. All rights reserved. Distributed by AllAfrica Global Media (allAfrica.com). To contact the copyright holder directly for corrections — or for permission to republish or make other authorized use of this material, click here.